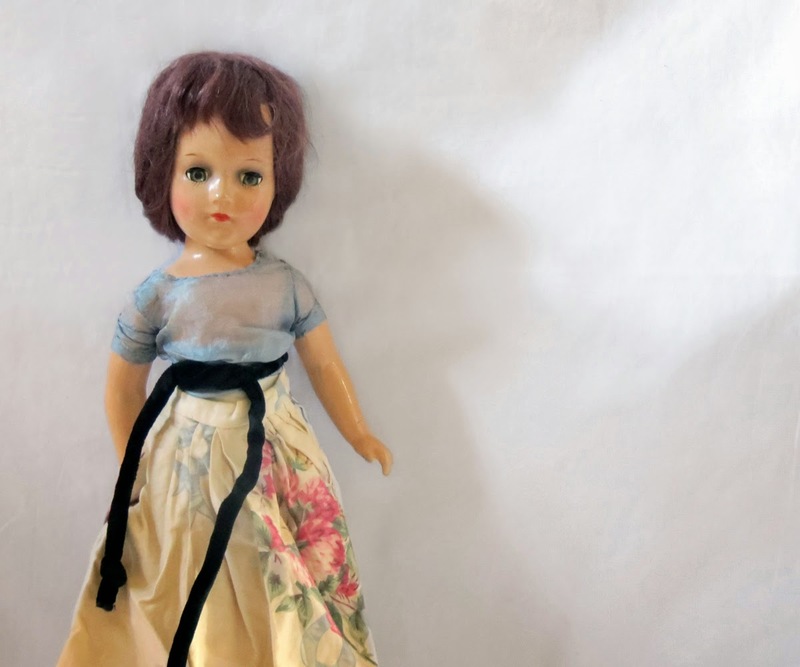 Mulberry Whisper: A Rare Find - a Mary Hoyer Composition Doll! 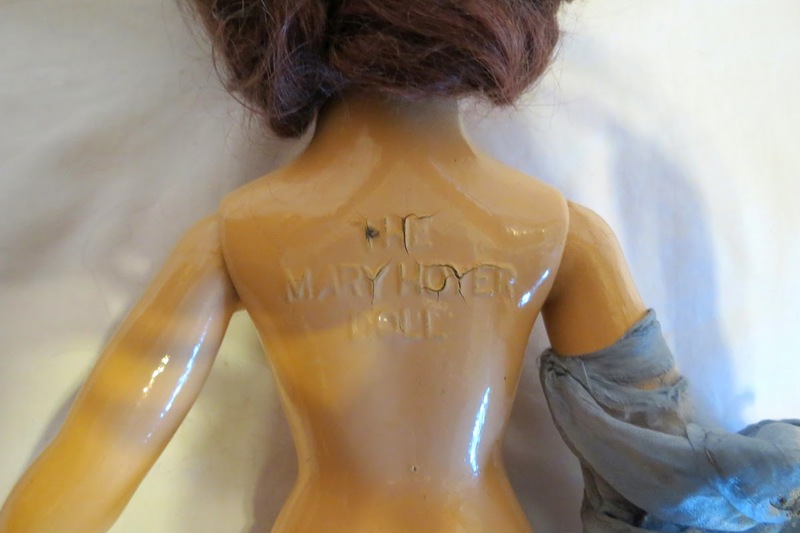 A Rare Find - a Mary Hoyer Composition Doll! I always say that buying and researching vintage things is a very exciting thing to do. 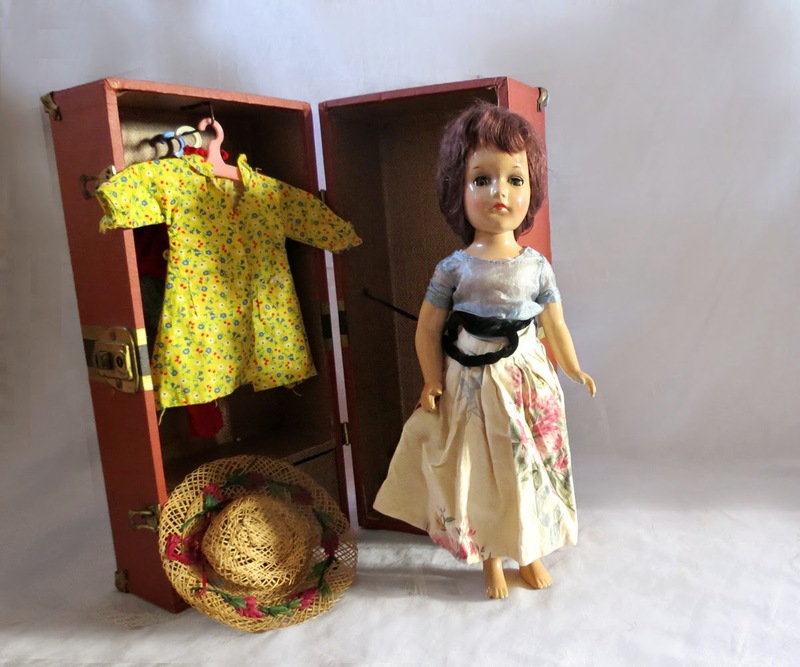 My cousin Gafa has recently bought this vintage doll with a trunk which we found to be a very old Mary Hoyer doll, dating to the period from 1937 to 1946. She is made from composition, jointed, with a short haircut which was very fashionable then, and with beautiful gray sleep eyes. I like her thoughtful look and retro make up - she is so different from what we see now. Unlike modern dolls with incredible legs and huge eyes, this one looks like a real person, even though of course her proportions are not realistic. And our doll is incredibly stylish! Look at her trunk, full of clothing and accessories. I think some of these were home made, which means that the doll was loved and cared for. I heartily congratulated Gafa with this amazing find. You can see the marking on her back. This is what Doll Reference says about her: "1937-1946 Mary Hoyer doll, 14" tall, all composition jointed doll, mohair wig (some have molded hair beneath the wig), sleep eyes usually blue but some root beer brown have been found, or painted eyes with painted lashes, real upper lashes, painted lower lashes, closed mouth, many different outfits were made for this doll, as well as patterns were sold, that could be knitted or sewn by the dolls owner. Mary Hoyer made clothing will have a Mary Hoyer tag. Doll marked: The Mary Hoyer Doll in raised print". That is such a great find! So delicate looking and the name on the back is so cool!